Often applications require users to insert date, such as Date-of-Birth, Start Date of employment and so on. selectInputDate component allows programmers to offer user safe and convenient way of entering date without worrying about format, locale and other features, which may vary from place to place. This tutorial will show how to create a basic calendar object and also how to change it in order to adhere to corporate and architectural presentation standards. As all other ICEFaces components, selectInputDate is designed to use CSS styles. You will see how easy it can be to apply CSS to various parts of the component. Download the dataTable-basic source code here. This is your first and very basic calendar. Selected value is stored in the backing bean as date1 property. As you can see, basic calendar and popup calendar are in fact the same component. renderAsPopup attribute controls the way of how the component is displayed. Download the calendar-popup source code here. This part of tutorial shows how to use converters and validators together with calendar control. If you are not familiar with basics of using a validator, you can refer to validators tutorial. Converter and validator can be added to both basic and popup calendar. In this example, we chose the pattern of how the date will be presented and we also chose time zone using standard java TimeZone class. If you create a corporate web site for the workers in the different time zones, this feature may be very handy. Often programmers need to restrict users on which dates they can insert. If it's a birthday it must be in the past, if this is a flight it must be in the future, and so on. While users are on their own at the time of selection, the programmers can restrict the use of the improper dates by using validators. Validator also requires additional setup in faces-config.xml, where we tie validatorId with actual class. highlightClass defines css classes for the highlighted components. 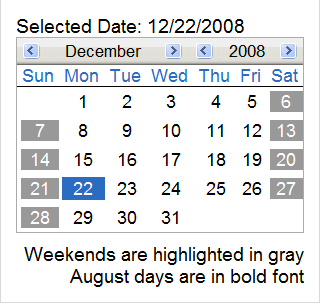 example highlightClass="weekend: august:" shows that 2 classes are defined in css file called weekend and august. Highlights will appear based on the classes.